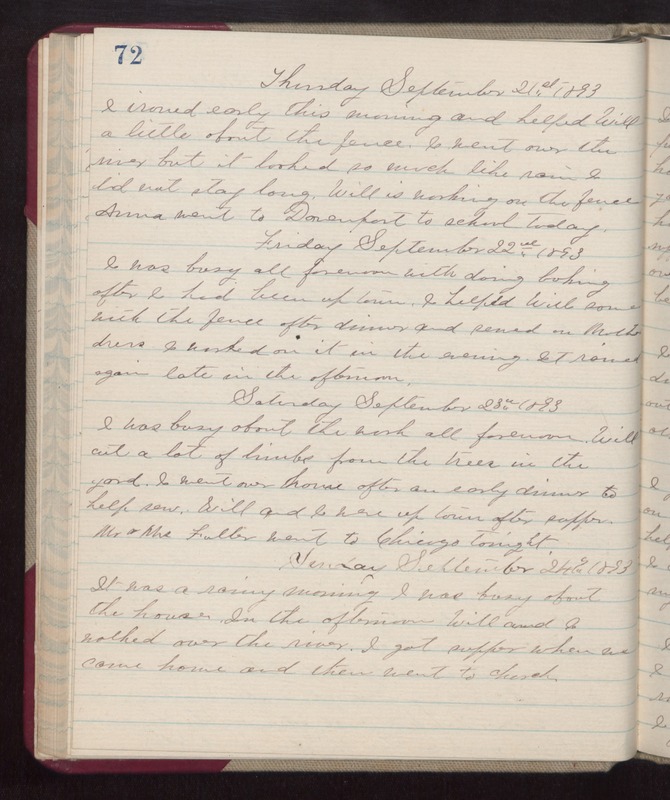 Thursday September 21st 1893 I ironed early this morning and helped Will a little about the fence. I went over the river but it looked so much like rain I did not stay long. Will is working on the fence Anna went to Davenport to school today. Friday September 22nd 1893 I was busy all forenoon with doing baking after I had been up town. I helped Will some with the fence after dinner and sewed on Mothers dress. I worked on it in the evening. It rained again late in the afternoon. Saturday September 23rd 1893 I was busy about the work all forenoon. Will cut a lot of limbs from the trees in the yard. I went over home an early dinner to help sew. Will and I were up town after supper. Mr & Mrs Fuller went to Chicago tonight. Sunday September 24th 1893 It was a rainy morning. I was busy about the house. In the afternoon Will and I walked over the river. I got supper when we came home and them went to church.